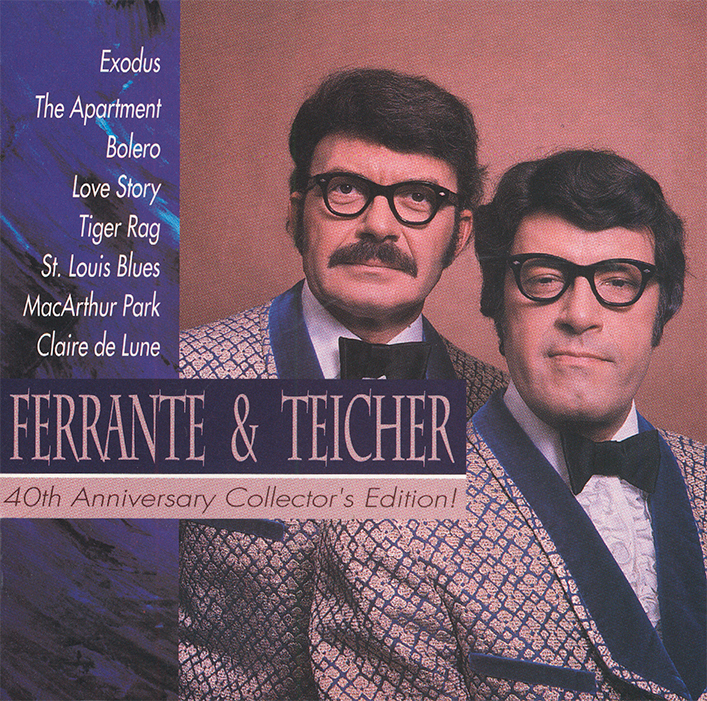 Ferrante & Teicher album: 40th Anniversary! Home > Discography > Original Albums > 40th Anniversary! Most of the tracks on this 1992 2-CD set were taken from the Bainbridge albums of the mid-1980s. However, it is included as an "original" album due to the inclusion of several previously unissued "collector's tracks." Two men. Two pianos. And two hearts of gold. That’s Ferrante and Teicher! After 40 years as one of the most amazing success stories in show biz, it’s time to celebrate. Arthur Ferrante and Louis Teicher were only two years old when people noticed something unusual about them. Whenever they sat at the keyboard, they displayed an extraordinary talent. Several years later, the youths met at the Juilliard Preparatory School in New York, where they sparked a friendship that spanned a lifetime. After being given the normal battery of Juilliard Prep tests, it was confirmed that both were indeed prodigies. Both were given full scholarships to the world renowned school, which strictly guided their musical development. The piano was foremost, but theory, composition, arranging and conducting were also mandatory. Both boys excelled in all facets, absorbing musical knowledge as fast as it was dispensed to them. The seed was finally sown when the 10-year-olds enrolled in a piano ensemble class. Performing piano duets with fellow students fascinated them, and, when the two paired together, an unusual chemistry was created. Their instructors took note as did young Art and Lou. Noticing that four hands and one piano could be somewhat restrictive, their instructors quickly placed them side-by-side at separate pianos. The stage was set for what was to become the world’s greatest piano duo! The next few years found Ferrante and Teicher graduating with not only a multitude of awards and honors, but also a deeply profound friendship. But, like most graduates, each was anxious to test the waters around them. Ferrante was hired as the accompanist for the renowned dancer Paul Draper. After three years of touring, Ferrante moved to Hollywood, where he joined the musical staff at Paramount. Teicher, meanwhile, remained in New York, where he played for the Broadway smash Song of Norway. After two years of performing the popular Grieg transcriptions, he was offered the assistant directorship and principal pianist position of the touring cast. For both, a career decision loomed. Despite their separate paths, Ferrante and Teicher remained close friends. After much discussion about collaborating, a tour was planned. To generate income, both accepted faculty positions at Juilliard and, on weekend, played swanky clubs throughout New York City. Performing classical by day and pops by night, Ferrante and Teicher quickly amassed a local following. In 1950, National Concerts booked them on their first classical tour. Playing for small but eager audiences nationwide, Ferrante and Teicher received rave reviews. Oftentimes, the highlight of their classical concerts was the encore section, which featured popular selections from their nightclub act. Tico-Tico, Tiger Rag, Begin the Beguine and Jealousy all turned the crowd into a wild frenzy. With Ferrante and Teicher’s tour being self-sustained, the word spread. Radio emcees, like Percy Faith, Mitch Miller, Maggie Fisher and Eddie Dowling, introduced them to a new sea of listeners. In 1952, the duo made their T.V. debut on Chicago’s WGN. Unfortunately, nobody warned them about what to wear, so their white tuxes washed out their faces and hands on live television. Ferrante and Teicher’s frequent radio appearances soon caught the ears of record company executives. Columbia Records issued the duo’s first LP consisting of popular repertoire. Hi-Fi buffs rejoiced when Ferrante and Teicher’s Hi-Fireworks LP was subsequently released. This avant-garde recording of Ferrante and Teicher’s “prepared pianos” soon became one of their trademarks. These off-the-wall audio experiments soon found Ferrante and Teicher’s pianos laden with specially devised rubber mutes and strips of Masonite and steel. These devices, coupled with pounding, plucking and strumming of pianos innards, created an unforgettable effect! When on a roll, Ferrante, Teicher and engineer Al Weintraub would record all night. These captivating recordings eventually caught the eyes and ears of T.V. producers, and soon Ferrante and Teicher were prime-time heroes thanks to Gary Moore, Perry Como and Ernie Kovacs. Another record label, Westminster, commissioned Ferrante and Teicher to record their growing library of classical literature as well as that for “prepared pianos.” In 1958, Ferrante and Teicher moved to the larger ABC records, where long-time friends Joe Malin and Nick Perito worked. Throughout the fifties, Ferrante and Teicher slowly acquired a large following of devotees. Their annual concertizing not only strengthened, but also streamlined their diverse repertoire. While recording more “prepared piano” material at ABC, the most prominent figure to date entered their lives: Don Costa. As an established producer, Costa had the gift of taking raw talent and molding it into a masterpiece. His vision for Ferrante and Teicher unfolded quickly. Upon completion of the “prepared piano” LP Blast Off, Costa steered Ferrante and Teicher into a new direction. The vehicle was the LP Themes from Broadway Shows, which featured straight twin-pianos, bass and percussion in a collection of clever cocktail music. After Costa left ABC for the recording company of United Artists Pictures, he immediately signed Ferrante and Teicher. Late in 1959, Costa stumbled onto a theme being composed for United Artist’s upcoming movie release The Apartment. After rushing the score to the classically trained Ferrante and Teicher, Costa went out on a limb commissioning and writing a full orchestral arrangement. Afterward, he handed the score to Ferrante and Teicher and said, “You guys put in the twin-pianos.” Those associated said “Two pianos — It’ll never sell.” Even Ferrante and Teicher doubted the rock ‘n’ roll era would embrace a recording of this nature. Three weeks after its release, Theme from the Apartment was a top-10 smash-hit. Before The Apartment dropped off the charts five months later, another Costa/Ferrante and Teicher collaboration, Exodus, soared to number one on the charts. “Exodus was number one in every country except Israel!” recalled Teicher. So inborn was “The Movie Theme Team” that Tonight became their third Gold Single. During their remarkable career, Ferrante and Teicher charted over 100 recordings, including One-Eyed Jacks, Goodbye Again, Lawrence of Arabia and Anthony and Cleopatra. Even entire LPs — sometimes six a year — charted lofty positions. In 1962, Ferrante and Teicher placed seven albums on the charts at once! After enduring the riggers of show business for almost two decades, Art and Lou took their next and final step: international stardom. William Morris in New York controlled their touring while United Artists signed them to a six-year contract. Television and orchestral appearances claimed the remaining time. Arranger/conductor Nick Perito took control in the studio with assistance from Marion Evans, Leroy Homes and Don Costa. Ferrante and Teicher, meanwhile, wrote most of the arrangements. During the sixties, Ferrante and Teicher recorded 60 album; performed 1,800 concerts; traveled over 2 million miles worldwide; and appeared numerous times on The Ed Sullivan Show, The Tonight Show, Bell Telephone Hour, American Bandstand and the variety shows of Danny Kaye, Steve Allen, Dean Martin, Patti Page and Mike Douglas. Also included were major appearances with North American symphonies, conducted by Henry Mancini, Arthur Fiedler, Gordon Jenkins, Richard Haymen, Eric Kunzel and Percy Faith. These performances, which bridged classical and pop, helped create what we commonly call symphonic “pops” concerts. Late in 1969, during a typical day of arranging for a new album, Ferrante and Teicher penned another million-selling, top-10 single: Midnight Cowboy. Its success rejuvenated their career and attracted a whole new generation of followers. The seventies and eighties found Ferrante and Teicher in a much more relaxed pace than the sixties. Although TV variety shows had fallen from the airwaves, Ferrante and Teicher were still seen on Evening at the Pops, Dinah, Mike Douglas, Name That Tune, Hollywood Squares, Entertainment Tonight and Crook and Chase. Ferrante and Teicher remained humble to their “we-knew-you-when” fans from the forties and fifties. Undaunted by their popularity, Ferrante and Teicher frequently returned to every place, from Great Bend, Kansas, and New York City to Toronto, Canada. Never sacrificing musical artistry for showmanship they became mainstays of music festivals like the Ravinia, Blossom, Garden State Parkway, Hollywood Bowl, Wolf Trap, Red Rocks, Chastain Park and the Riverfront. After leaving United Artists in 1979 where they had amassed some 1,000 recordings, Ferrante and Teicher decided to give their fans something they had been requesting for years. They formed Avant-Garde Records in 1983 and began a series of new recordings featuring only duo-pianos. This was the essence of Ferrante and Teicher — the way it all began at Juilliard. With the foundation of titanium carefully built under them, Ferrante and Teicher created and achieved their own nitch in American musical history. Today, they are still adored and admired by millions of fans. Their rich legacy has not only inspired many of today’s biggest stars, but also earned them a lofty perch among history’s greatest entertainers. Congratulations, Art and Lou, on 40 marvelous years! The unselfish sharing of your talent, love, humor and warmth has touched everyone throughout the world. May your music continue to entertain and inspire… ! Producer’s Note: The “Collector’s Tracks” in this collection are truly rare. The recording sources are currently unknown. We do know, however, that Concerto Themes, Take a Bow and Nocturne in E-Flat were performed live by Ferrante and Teicher in 1960-61. Ferrante and Teicher debuted the Fiddler on the Roof Overture in concert in 1972. Historically, these recordings had to be included in this collection.